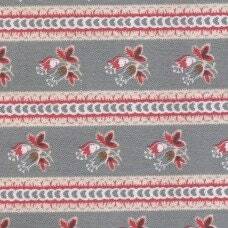 Dutch Heritage is a beautiful range of reproduction fabrics by Petra Prins and Nel Kooiman. The collection copies large scale chintzes and indiennes. When in the 17th and 18th century the VOC (Verenigde Oost-Indische Compagnie) sailed along the Cape to India they found beautiful hand painted and hand printed cotton fabric. These fabrics were of a superior quality with colourful plant and flower patterns. On the way back, amongst other merchandise, they brought these beautiful fabrics, called chintz, home and it was not long before these chintz became very popular. They were not just used for interior purposes, but as well for clothing; Women’s skirts and blouses and men’s robes. Wonderful pieces can be found in different Museums, not just in the Netherlands but also in England and France. To this day, you can still find the fabrics in the Dutch traditional clothing, worn in Marken, Hindeloopen and Spakenburg. These timeless prints still appeal to our imagination. It is therefore in conjunction with Petra Prins and Nel Kooiman, Dutch Heritage is reproducing a number of these beautiful prints directly from their private collections. The fabrics are most suitable for patchwork and quilting. New designs are being constantly developed and will co-ordinate with the existing collections. This fabric does not have the polished finish of chintz. Please check my shipping information and store policies.